One of my favourite things to do is to go to the theatre. Theres something so captivating about live theatre whether I’m watching a play, a musical or anything in between. Its a real treat for me to go to see a show and I like to do it as often as my budget will allow. When I heard that one of my favourite musicals, Hairspray, is touring the country again, I was so happy. I love the music and songs, the laughs and the fashion but most of all, I love the feel good message that the musical sends out. Many years ago, I went to see Hairspray at the Sunderland Empire with my hubby and we got to meet Les Dennis and Michael Starke after the show. I just wish our selfies with them had been on a better camera as my phone at the time wasn’t didn’t take as high quality snaps as my phone does now. However I do still have my memories and especially the memory of how positive, uplifted and happy I felt after watching the performance. I even wrote about going to the musical on my blog five years ago! You can read the post here. Entwined in the storyline is a focus on acceptance and inner beauty. Hairspray is very much about celebrating body confidence and emphasising that all body shapes and sizes are beautiful which is something that I very much stand for myself. To me, a big part of being body confident is to look and, more importantly, feel confident in what you’re wearing. This is very accurately represented in the musical as the outfits worn by the cast are very much about showing off their bodies, regardless of their size, in fun, flirty, figure flattering clothes. The fashion in Hairspray The Musical epitomises all that was great about 1960s fashion. From full skirts to feminine dresses that nip in at the waist, plaid print on skirts paired with cute blouses and sweaters and hair bows, pearls and super huge hair. The great thing is that there are elements of this fashion style that are still just as relevant and, dare I say it, trendy to wear today. The quickest way to update your wardrobe to this style is with skirt or a dress which are very much statement pieces from the musical and the era itself. If you’re looking for a full circle skirt, then the Sprinkle of Glitter Netted Skirt is a great place to start. This is a statement piece that would be lovely for a special occasion where you’ll up dancing as the ivory net lining under the deep rose pink skirt will look great when you’re swishing about the dance floor. Theres and exposed gold zip at the back too to bring this skirt right up to date. Wear with a little top and button up or open, boxy cardigan with a pearl statement necklace for a modern twist on the 1960s Hairspray style fashion. If a full skirt isn’t your cup of tea, then try out a pencil or short skirt in either a plain, plaid or check print. Pair with a top with a peter pan collar and some Mary Janes you’re good to go! If, like me, a dress is more your thing then you have so many options. Tunic or shift style dresses were so popular as were prom dresses which are my favourite. Tunic or shift dresses are the less shapely option of the two. These look especially lovely when they have a peter pan collar and are a great transitional piece because they can be worn alone, or with thick tights during the colder weather. These dresses are ideal for day and evening wear, whether you’re at the office or a party. In comparison, prom dresses are far more shapely. They show off your waist, or create the illusion of a more shapely one and flatter the figure so beautifully. These dresses are fabulous for parties and special occasions and are my favourite style of dress to wear. 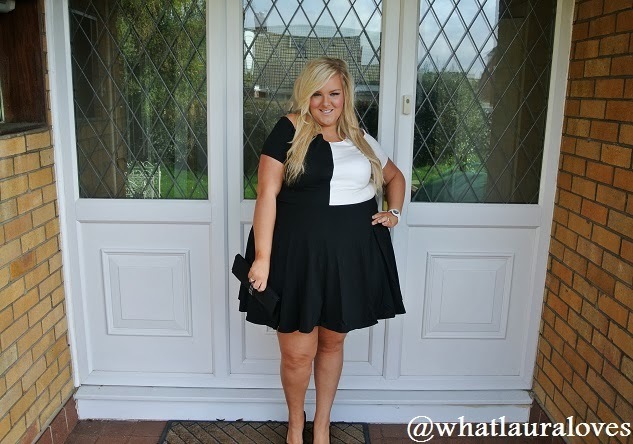 For my plus size readers, I’d highly recommend Scarlett and Jo when choosing a prom dress. They have recently brought out this one and I have had my eye on it ever since I spotted it! I own two Scarlett and Jo prom dresses already and have worn them countless times. Whether or not you opt for a traditional 1960’s print, pattern or colour, a prom dress shape is sure to look super flattering and really pretty and feminine. When I’m wearing one, my body confidence is definitely boosted and I walk with more of a spring in my step, just like those up on stage in Hairspray! Hairspray is touring until next May at so many venues across the country. You can find out the dates and where to book tickets on the website here. I can’t wait to see the performance again! What is your favourite thing about 1960s fashion? OMG I need these skirts. They are so cute and look so fancy yet casual at the same time. Simply gorgeous girl!!! You channel the 60s perfectly! I love how modern, yet throwback these looks are, you look stunning! Oh wow! I agreed with you that the 60s dress does look feminine and elegant. I want the dress. You look lovely on the printed dress 🙂 xo . I loved that floral dress, very feminine. 🙂 Reminds me I need to pick up a skater dress myself!